Using renewable energy to heat is challenging in Western Canada as neither solar thermal nor air source heat pumps (ASHP) are very efficient at -30C. In addition, they most often have to compete with natural gas, which is relatively inexpensive in British Columbia, Alberta, and Saskatchewan, making the economics poor in many cases. However, there are circumstances where they can make sense. Industries which require heat in the summer, or rural areas which rely on propane, often 3-4 times the price of natural gas (NG), should consider using renewables to supplement or replace their fossil fuel usage. Evacuated tube collector solar thermal (ETC ST) is the highest performing solar thermal technology and uses solar energy to heat a fluid within an evacuated tube. The vacuum chamber makes for better heat transfer and lower losses making this technology especially good for colder climates. The largest challenge with evacuated tube collectors is the unpredictable maintenance costs but a conservative estimate is 2% of the capital cost of the system annually. 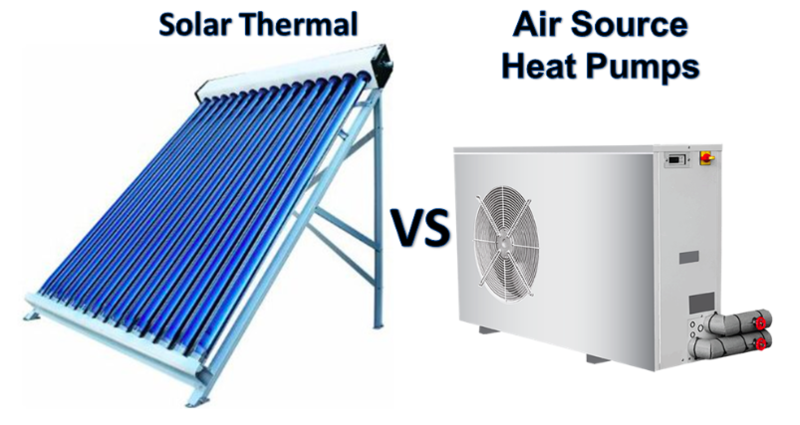 With solar thermal in Alberta, the economics are maximized when you can find applications which use heat in the summer, as this is when the majority of the heat is being generated. Air source heat pumps use the same technology that’s in your fridge, air conditioner or geothermal heat pumps. They take the energy in the outdoor air and, using the refrigeration cycle, deposit that energy into the indoor space. The efficiency is measured as the Coefficient of Performance (COP) and is the output energy (in heat) divided by the input energy (electrical consumption). The COP varies greatly depending on the respective temperatures of the indoor and outdoor air. If the outdoor temperature is -30C and you’re trying to heat a room at 30C, the COP will be close to 1, whereas if you want to take outdoor air at 15C to heat a room at 20C, the COP can be over 5! While heat pumps are not a new technology, innovation continues to improve its efficiency. Most recently, Variable Compressor Speed Inverter (VCSI) Technology has the industry excited for the new potentials. For the evacuated tube collectors, the system chosen was 4 x 30 tube collectors with a hot water tank for overnight storage of heated water. The pump to circulate the glycol would consume about $80 in electricity annually and we estimated the maintenance costs at $564/year. The hot water could be integrated with the existing infloor heating or be used to supply other industrial processes. The air source heat pump chosen for this case was an air-to-air 2.5 ton Daikin model (one of the higher quality heat pump manufacturers) which has a COP of about 4.3 when the indoor and outdoor temperatures are 37C and 16C, respectively. This would be the case if the HP only operated during the summer months when efficiency is maximized but, since electricity and propane are similar in dollars per unit of energy delivered, the air source heat pump could be operated year round to see additional benefit. In winter, the air source heat pump would average a coefficient of performance of about 2 but this is still half the price of propane! Annual maintenance fees for the air source heat pump were estimated at $250. A standard residential heat pump would only require $100-$200 in maintenance but made a conservative estimate because 37C is near the upper end of most heat pumps operating range. Natural gas is too cheap for either technology to compete at this point, but we’ll be keeping an eye on NG prices and the innovations in both technologies as there will likely be a time when the competition flips. Evacuated tube collectors when offsetting propane has a long payback in this scenario but a slight change in gas prices or a different location with higher solar irradiance could change that. With a payback of around 6 years, the real winner here is air source heat pumps as a retrofit for applications where propane is being used – especially if there is a heating load in the summer!